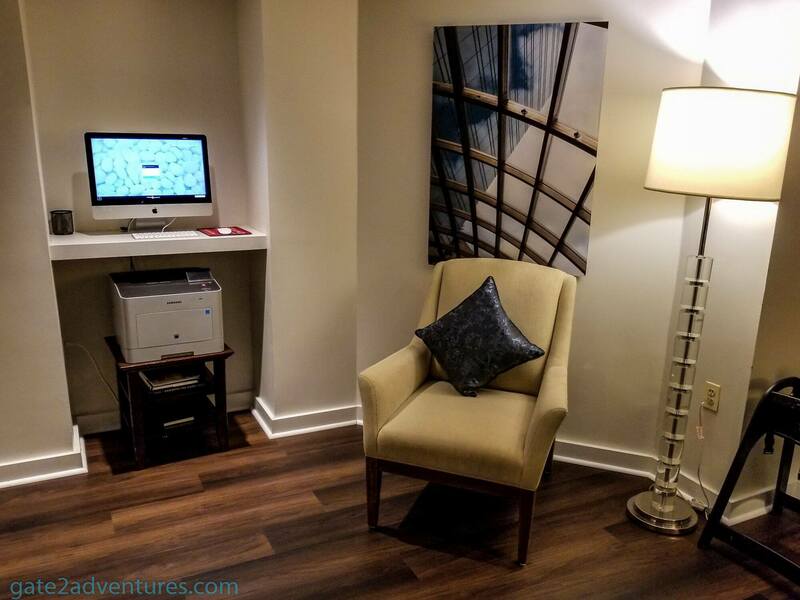 Hotel Review: Grand Hyatt Washington D.C.
Hotels & Lodging, USA, Washington D.C. 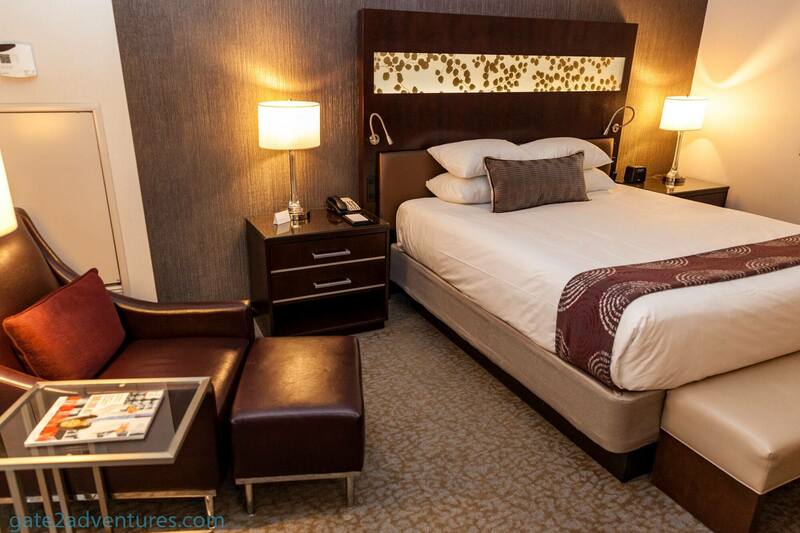 The Grand Hyatt Washington D.C. is one of the best redemption options of the World of Hyatt Level 1-4 Free Night Award. I had two unused Level 1-4 awards in my account which would expire mid of December. It was Thanksgiving-Weekend and rather than hanging out in Miami, I decided to head to Washington D.C. I haven’t been in the city in almost 10 years. The last time I was in town, I only had a few hours to spare to look at places. This time I would have 3 days and 2 nights to enjoy Washington. My flight was from Miami to Reagon National Airport. When I start planning my trip, I looked into ways to get to the hotel. Of course, there is the option of Uber and Taxi but I wanted to try public transportation. So I decided to go buy a Metro SmarTrip card to get from the airport to the hotel. I looked up the closest station to the hotel and for me, the chapter of getting to the hotel was closed. 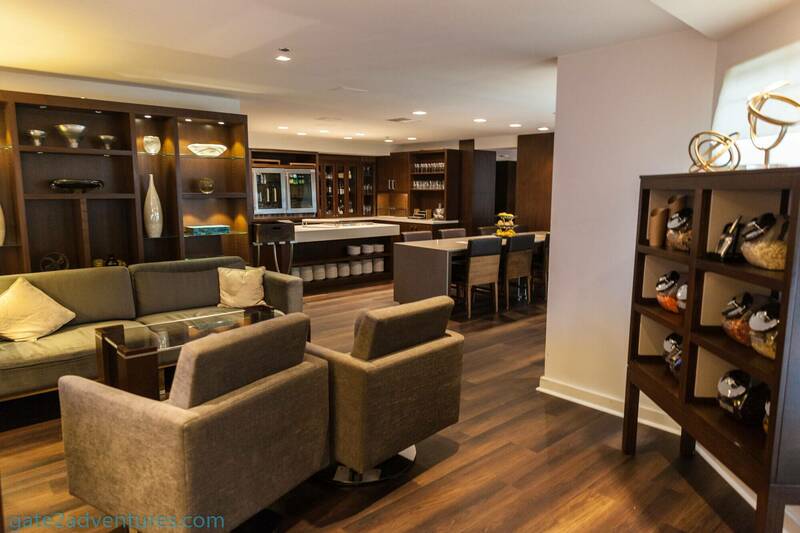 Taking the Blue Line and exiting at Metro Center Station is the most convenient way to get to the Grand Hyatt Washington D.C. from Reagon National Airport. Little did I know that it is even easier to get to the hotel. When I arrived at Metro Center Station, I took the escalators up all the way to the street level. 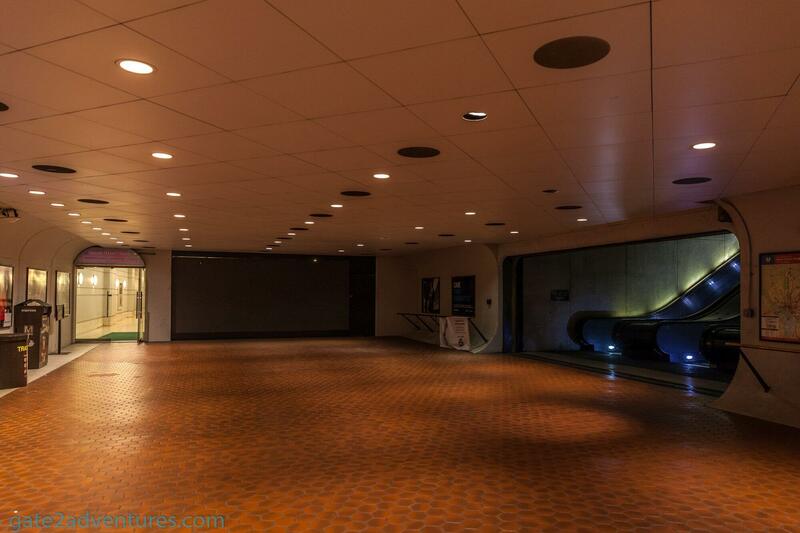 I didn’t see the small glass door in the corner of the 11th & G Street exit. 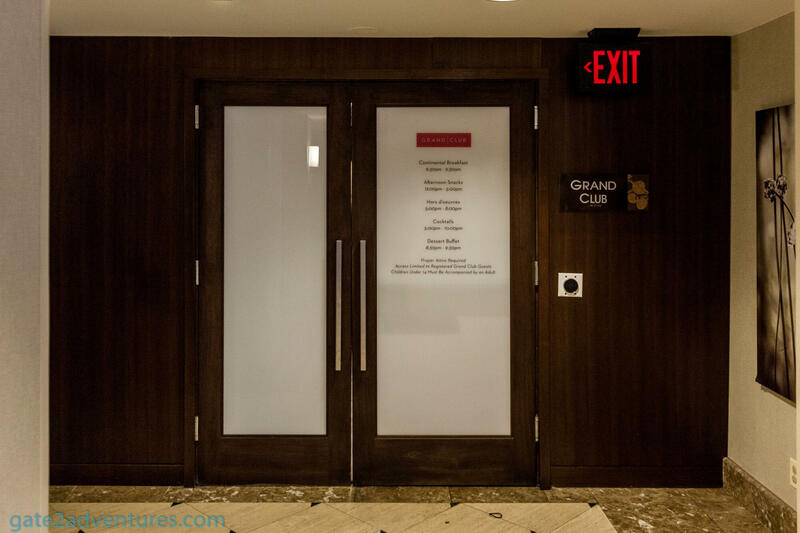 This door leads to a passageway which will bring you directly into the lobby of the Grand Hyatt. You have to get up two escalators and a few steps or an alternate ramp, if you have luggage. Unfortunately, no elevator is available from that side of the train station. I was able to manage it with one piece of luggage and a laptop bag with wheels to use the escalator to get to the train station to head to the airport. The only elevator for this train station is on the east side of 12th Street north of G Street. 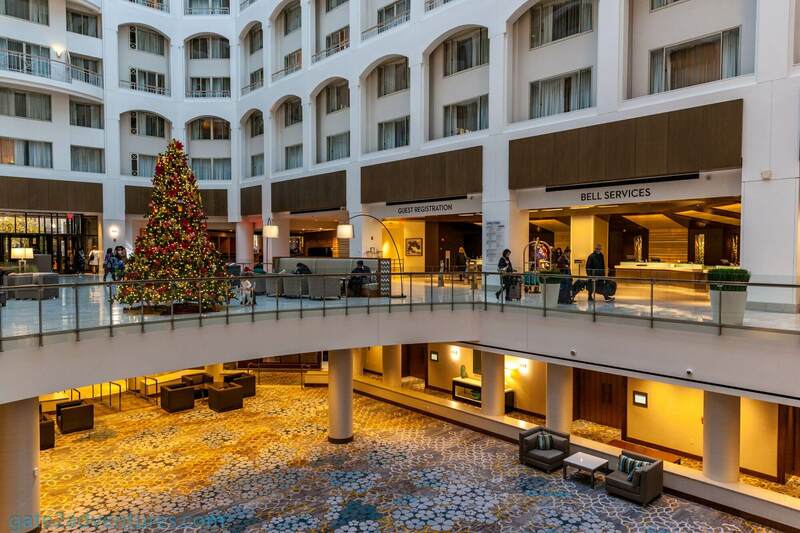 If you have luggage in tow and want to avoid stairs you can use the above-described passageway from the metro station or you go up to the street level and enter the hotel from the main entrance located on H Street NW, between 10th & 11th Street NW. There is a side entrance along 11th Street NW but you have to get up a few stairs to get inside. Same if you try to enter through the Starbucks on the corner of 11th Street NW & H Street NW. 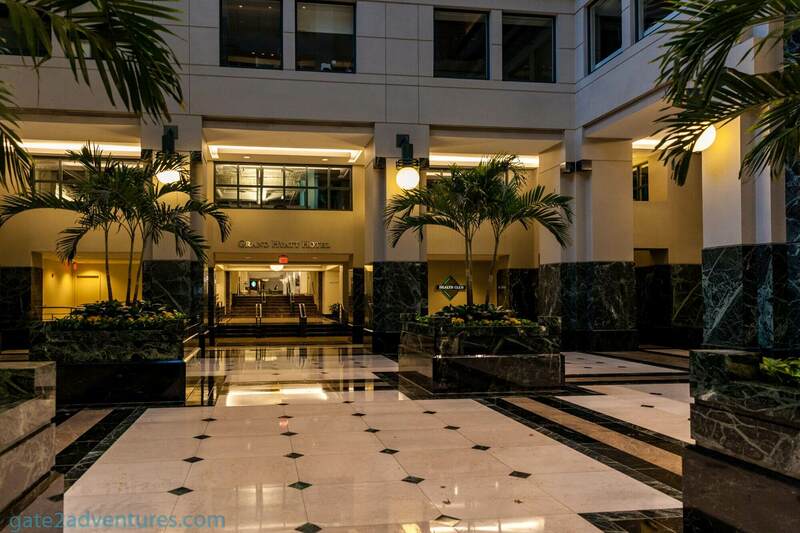 Once you step inside the lobby you can see the amazing atrium of the hotel when you arrive during the day. Take a look up to see the glass skylight. The front desk is easy to notice from whatever direction you enter the building. I walked up to the first available agent and he got me checked in. 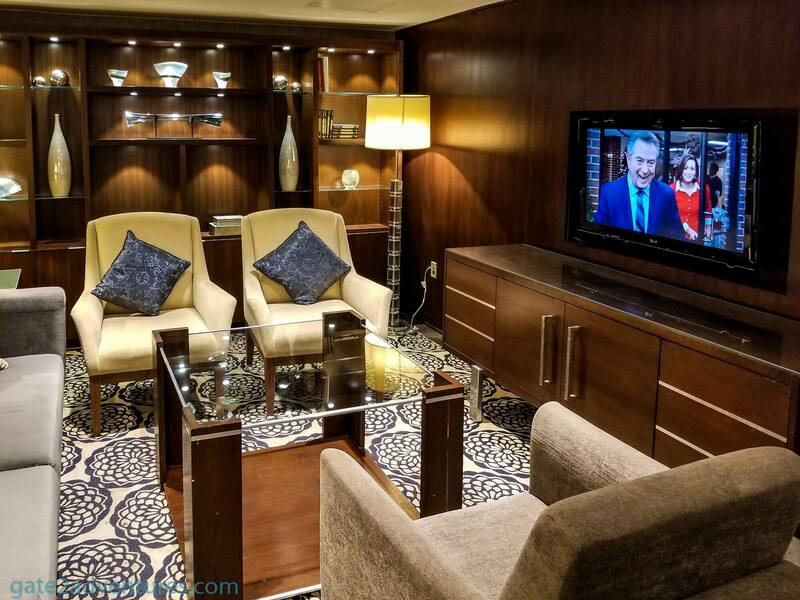 I was hoping that they have a suite available to apply my suite upgrade or get a complimentary upgrade but unfortunately, they were still sold out. Not even during the second night, a suite was available. My room was on the top floor on which the Grand Club is located as well. 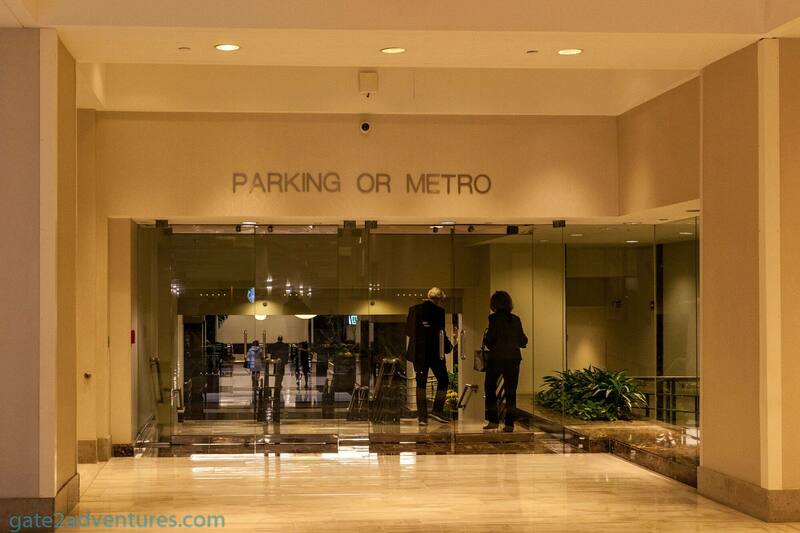 The elevators are at the far end of the lobby area, next to the doors leading to the metro station. Once you walk up to the elevators, keep in mind that there are two elevators behind you on either side. They are easy to miss when you walk up to the elevators from the front desk. I saw people waiting and waiting for elevators and the doors were opening behind them over and over. To access the 12th floor you have to tap your room key just above the button panel at the black circle. It will automatically select the 12th floor once tapped. My room was was on the 12th floor and just a few doors down from the Grand Club. The room has a window, well it’s more of a balcony door, facing the atrium. There is even a small balcony outside in front of the door, but you can only slide the door open a little bit. And the balcony is not accessible. However, the gap was big enough to stick my GoPro out of the window and capture some photos of the atrium. 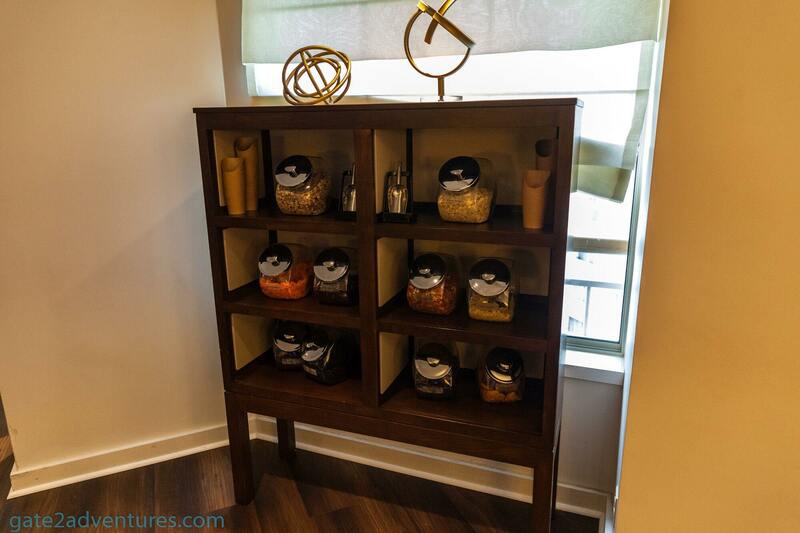 The room offered 351 square-feet of space and amenities to feel at home and to relax. Besides the spacious room itself, the bathroom was very well sized as well and gave me a feeling of space instead of feeling just cramped into the room. 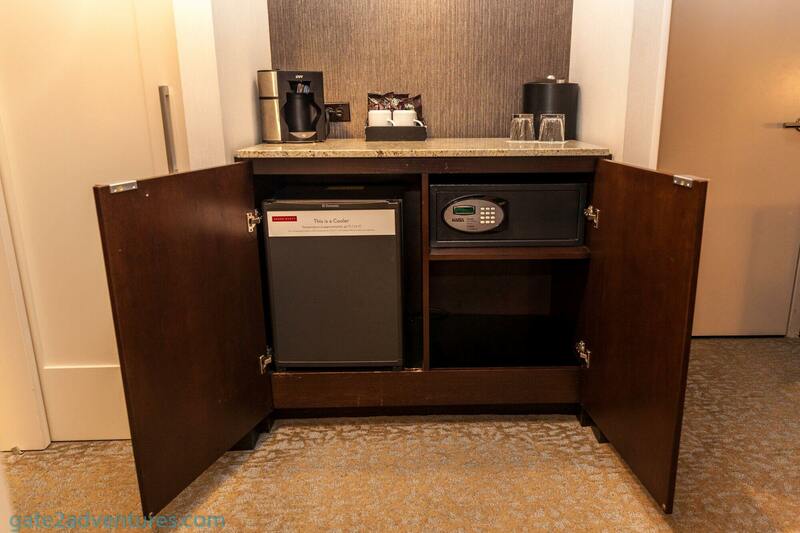 Inside the room, you find a safe, refrigerator, iron and ironing board. While the two nightstands on either side of the bed provide ample power outlets for your mobile devices. 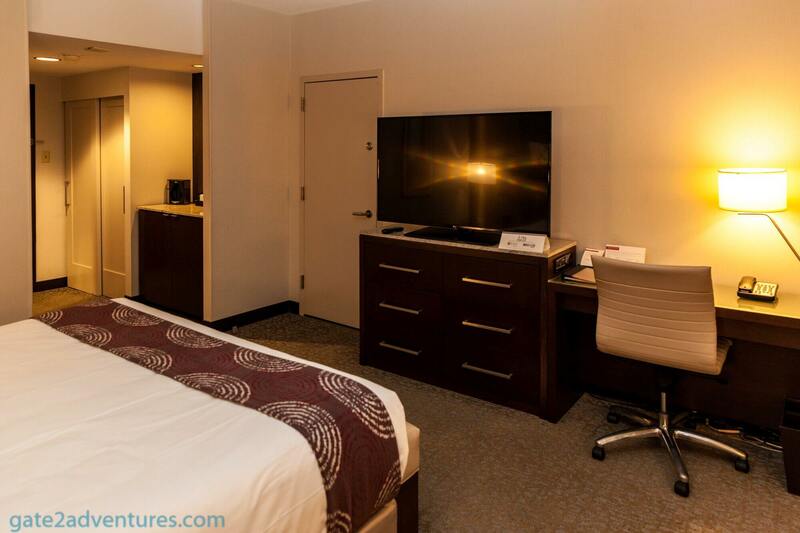 Adjacent to the bed is a 42″ flat screen TV powered by Chromecast. You can stream content from supported apps directly from your mobile device to the screen and watch it. I tried it with my iPad Pro and Galaxy Note 8. The only thing you need is an app called “stay connect”. The app also lets you rent movies to watch in your room and lets you control your TV like volume and channel. However, you have to pay a $0.99 fee to get access to the channel guide. This should be free, as it is with most TV providers anyway. The system still has flaws and I had sometimes connection issues. However this is independent of Hyatt, they just added this service to their hotel rooms as many other hotels did. I like the system and hope it gets improved and added to more hotels in the next few years. Just in case you are looking for some content, check out Movies Anywhere. Next to the TV was a work desk with a tempered glass top. I know tampered glass is beautiful and makes it feel more exquisite but laser mouses don’t work well on glass. On the other side of the TV is a connecting door to the room next to mine. 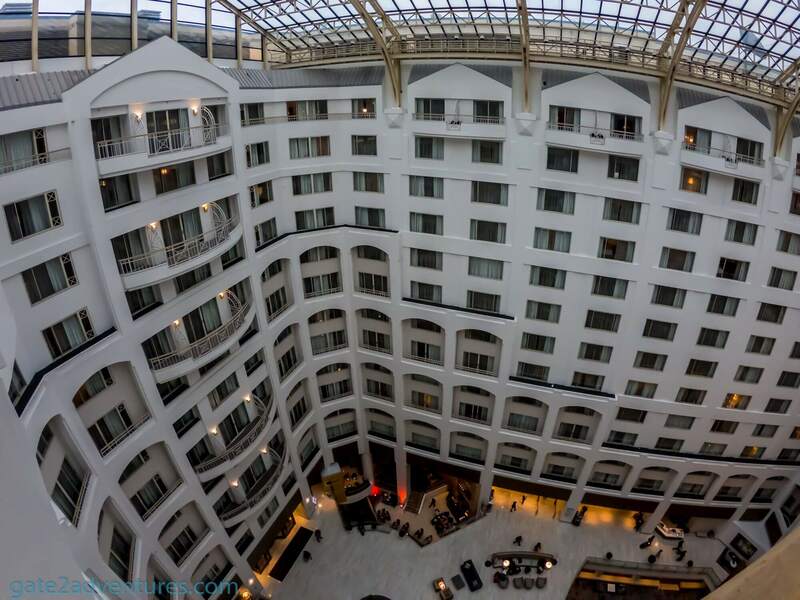 The most impressive feature of the hotel is no doubt the huge atrium. 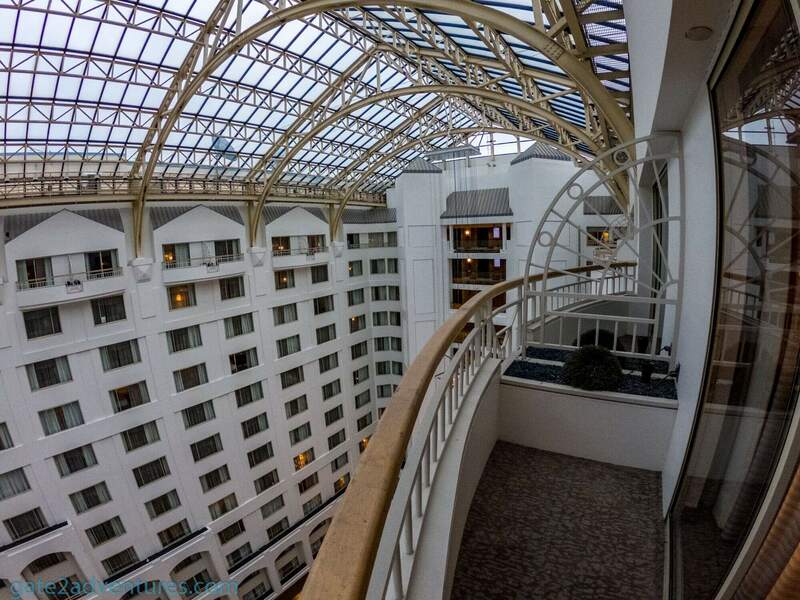 It spans from the lower level via the lobby all the way up to the 10th floor. While the lobby is pretty much on street level there are lower levels with conference and meeting rooms. 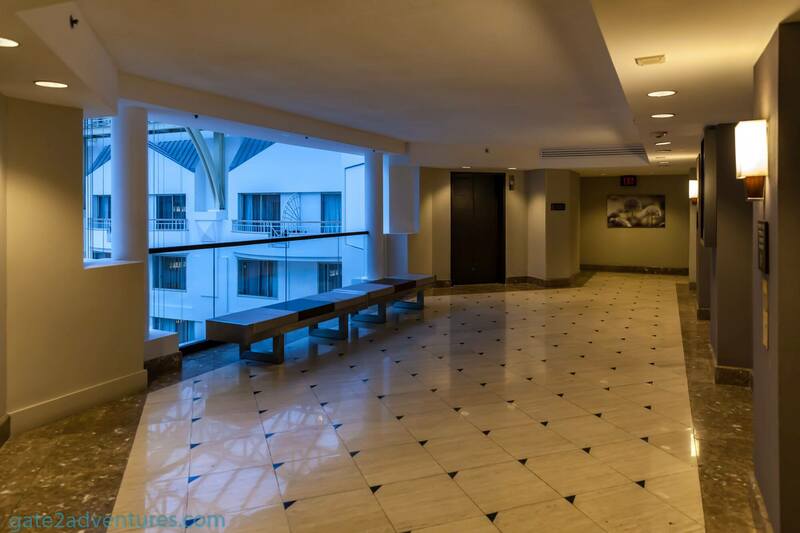 The lobby level has a huge opening in the middle of the atrium, so light can get down as well to the first level of meeting and conference rooms, which is called the “Declaration” level. While you find a lot of spots on the lobby level to sit down and hang out, there are more one level lower. On that level, it’s quieter as well, as no people are really passing through there if there is no event. 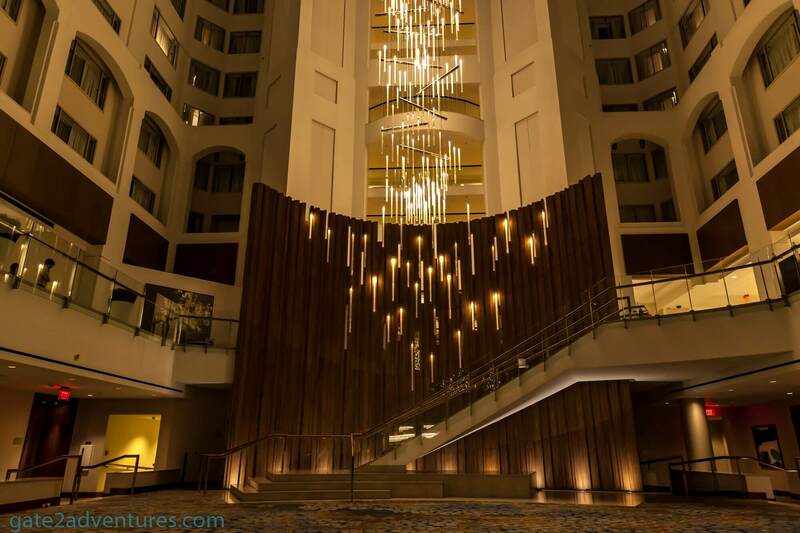 A big 4,000-pound, waterfall-like chandelier which extends over the whole atrium height all the way down to the declaration level is one of the main features of the lobby. 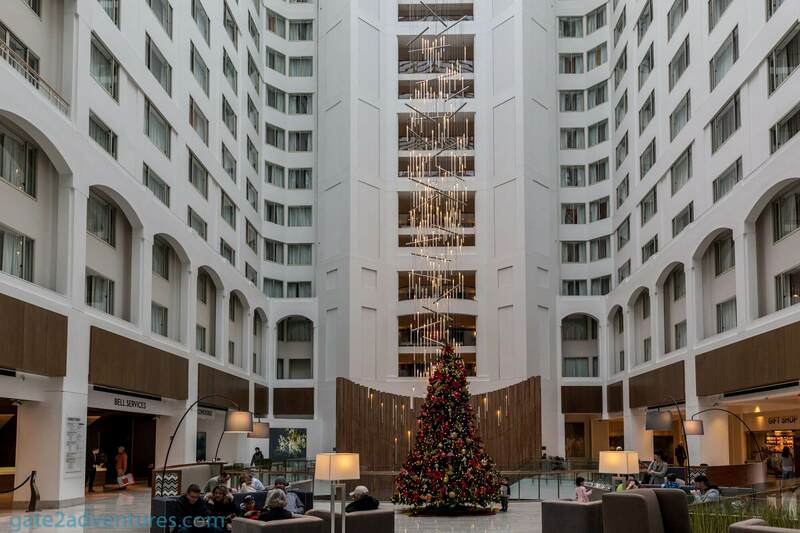 The preparations for the Christmas holidays were in full swing in town and the Grand Hyatt Washington D.C. had a Christmas tree placed in the lobby with plenty of comfortable seating around it. 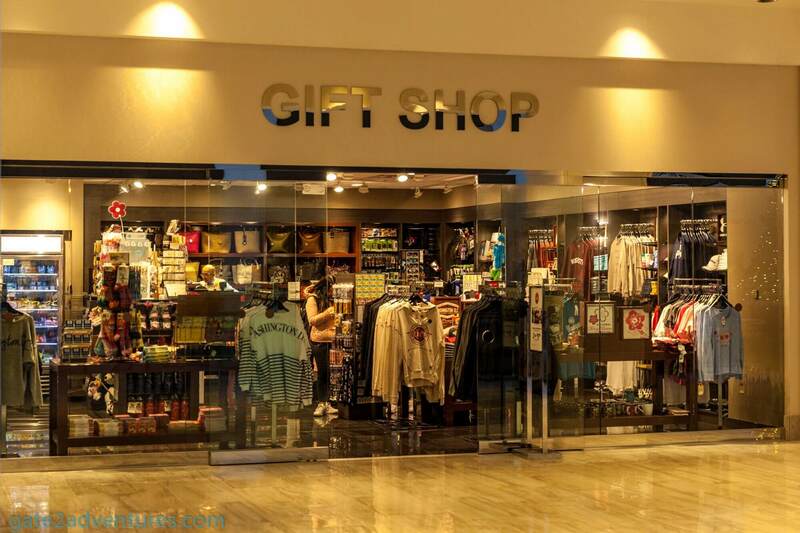 Furthermore, the hotel also has a 24-hour FedEx Business Center and two gift shops. 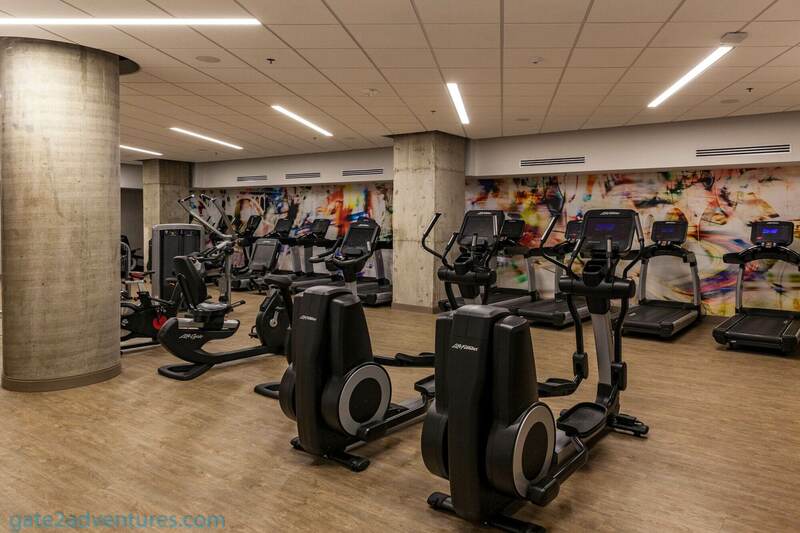 Access to the fitness center is complimentary for hotel guests and available 24 hours a day. 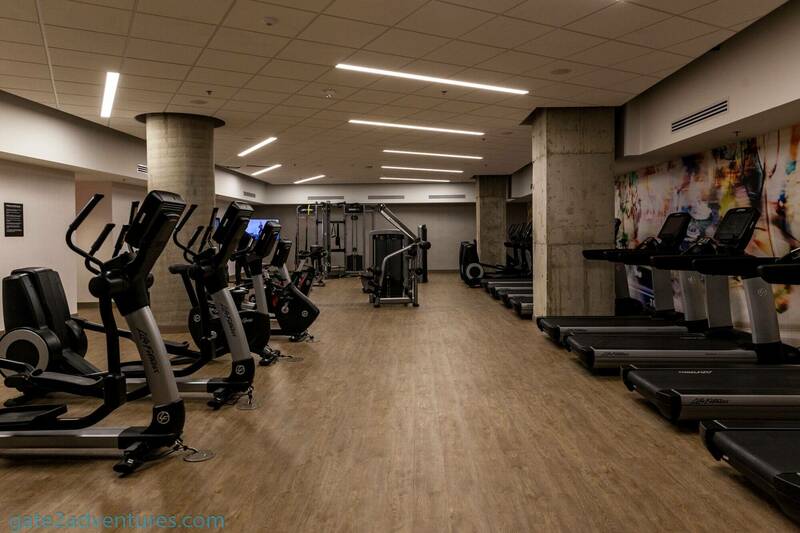 The fitness center is a bit hidden, as it is on the Lower Level 3. The elevator to the fitness center is located next to the entrance to Starbucks from the atrium. 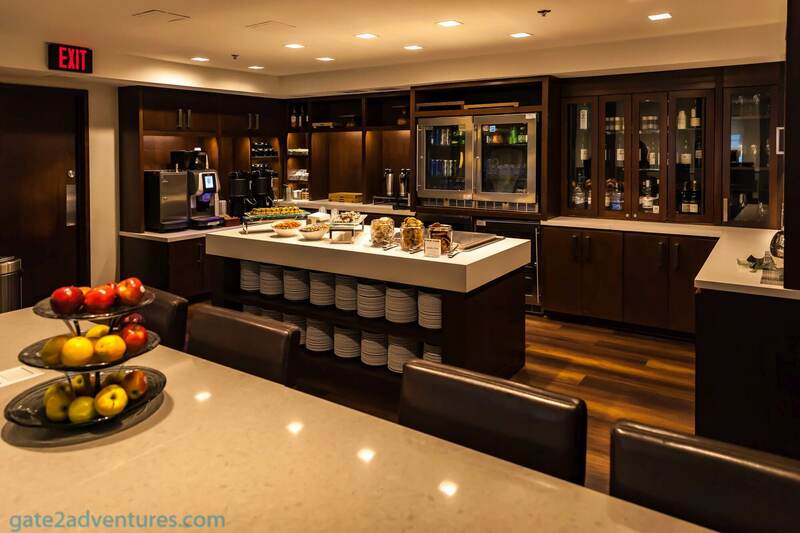 One of the things I love most about the Hyatt hotels is their clubs. 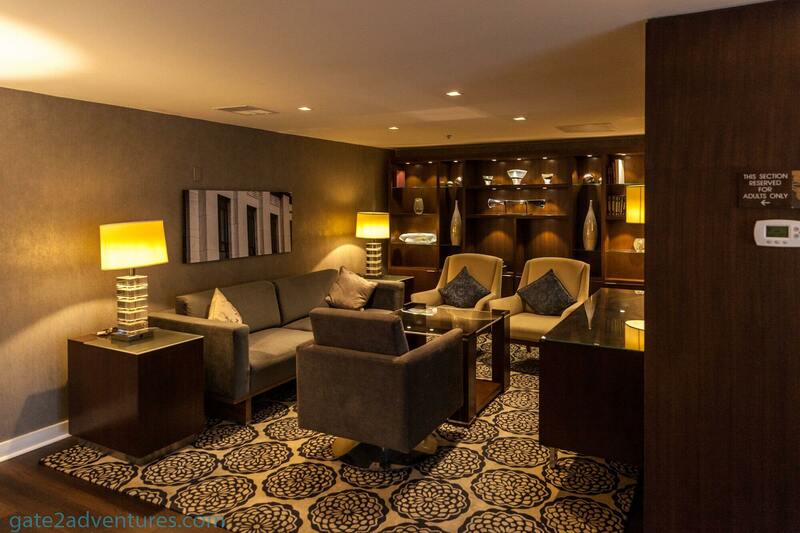 The higher tier hotels usually all have a club so does the Grand Hyatt Washington D.C. In the morning the club serves a cold breakfast. Yes, unfortunately. You can get cereals, bread, salmon, fruits and yogurt, juices and coffee but I really missed the usual scrambled eggs. 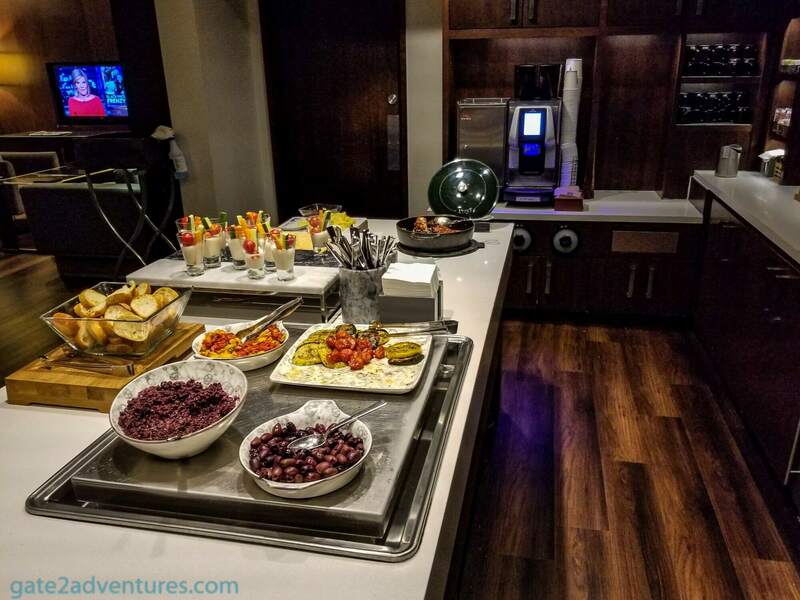 But even without the eggs in the morning, it is still a pretty good breakfast you get for free as a guest with access to the club lounge. 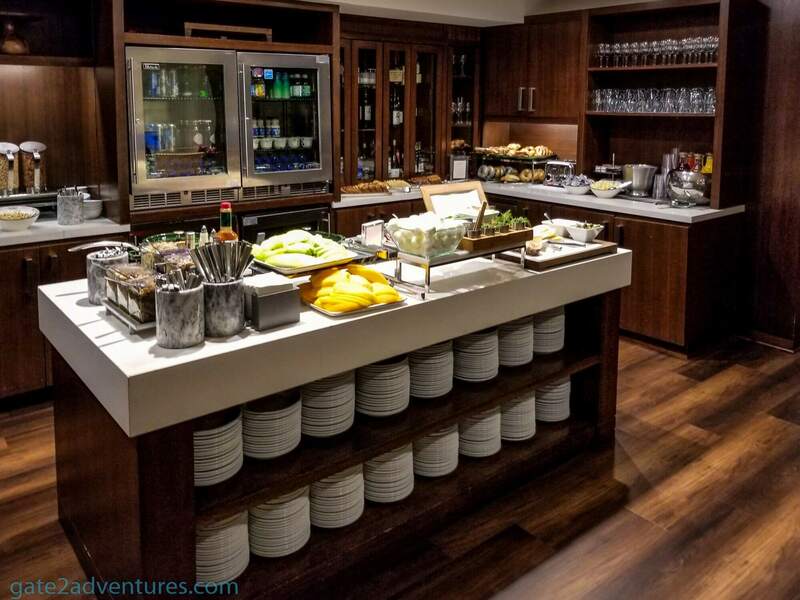 In the evening the club serves light snacks and appetizers. A great way to end the day with a light dinner. You can also select between one of the wines and beers offered during the evening service besides the soft drinks, water and coffee you have access to all day long until the club closes after the evening service. 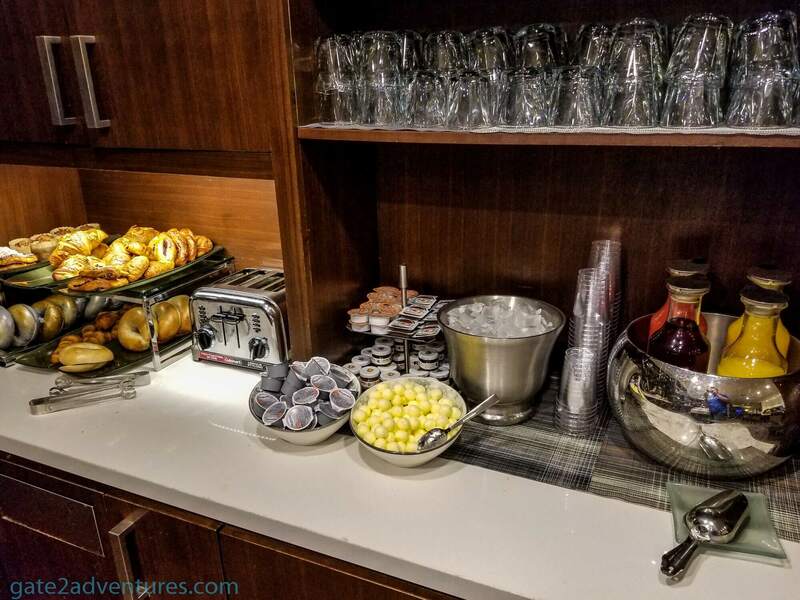 Between the breakfast and evening spread, you can grab some small snacks at the club besides the mentioned coffee, water, and soft drinks. The club layout is just gorgeous. One of the most beautiful in the United States. There is a designated adult only area. The tabletop counters along the atrium-facing windows feature iPads mounted on a stand. Great to read news while you eating. 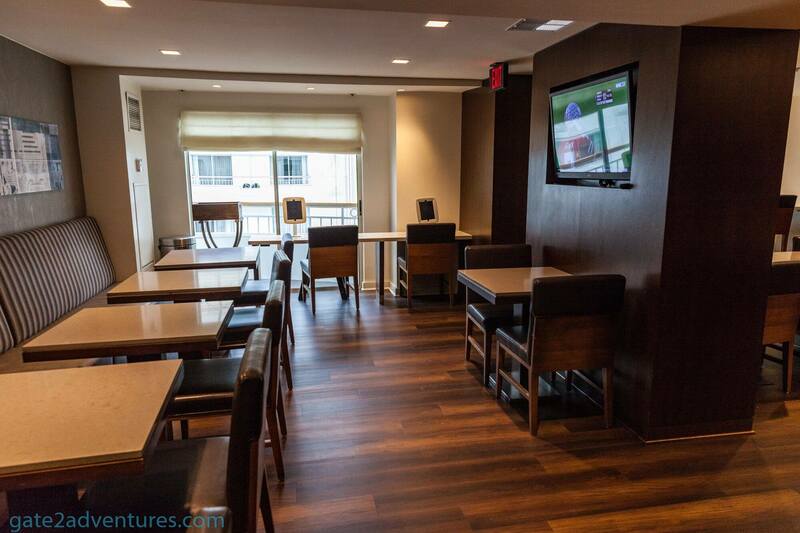 Besides just having meal service, there is also a workstation with printer in the Grand Club. Great to print off reservations or boarding passes. Staff could have been sometimes a bit quicker to clean up after someone left. Especially in the morning, when everyone is busy to get breakfast and leave to work or whatever plans they have for the day. But some people are just a shame too, they left a big mess behind on their table instead of carrying their trash and dishes over to the bins provided. 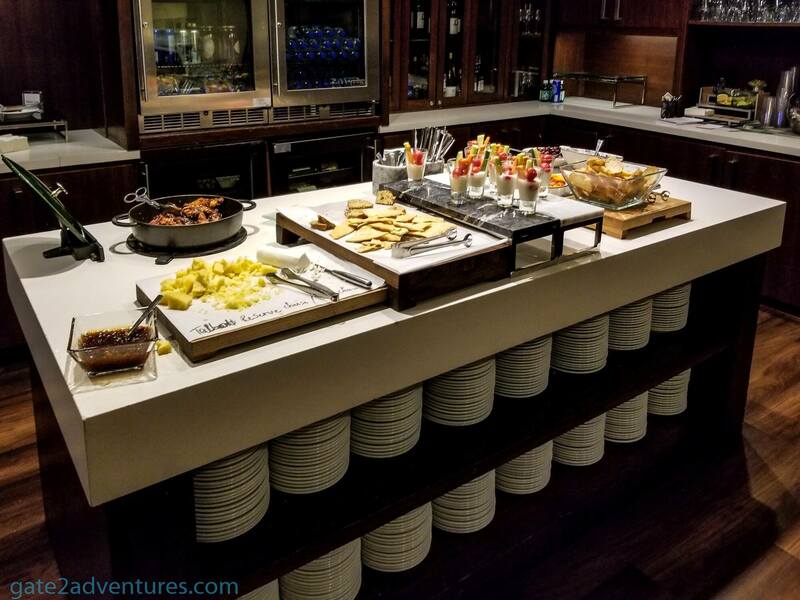 If you have no access to the club or looking for a bigger breakfast or meal in the evening, you can choose between the Cabinet Restaurant in the morning for breakfast and the Cure Bar & Bistro for dinner or lunch. 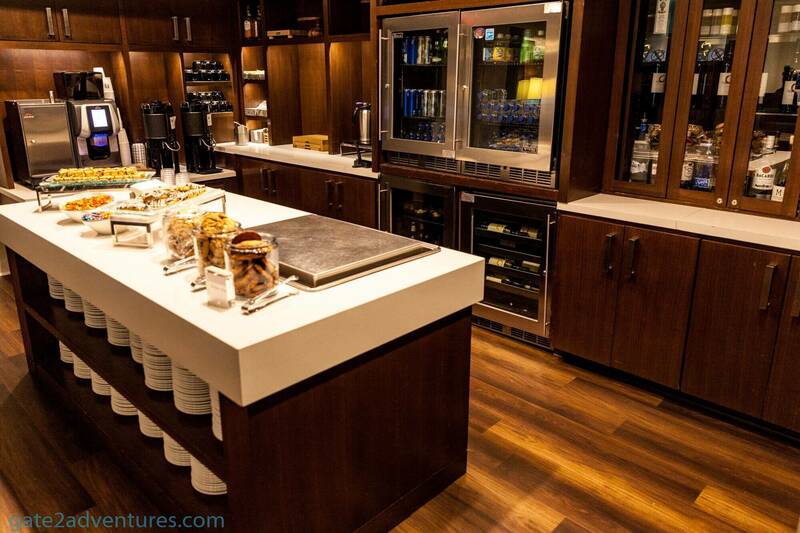 During the weekend you can grab breakfast and lunch until 3 p.m. inside the Cabinet Restaurant. Basically, there is always a restaurant open from 6:30 a.m. until 1 a.m. every day. One night I decided to have dinner at the Cure Bar & Bistro. It was quite crowded but I was able to get a table right away. 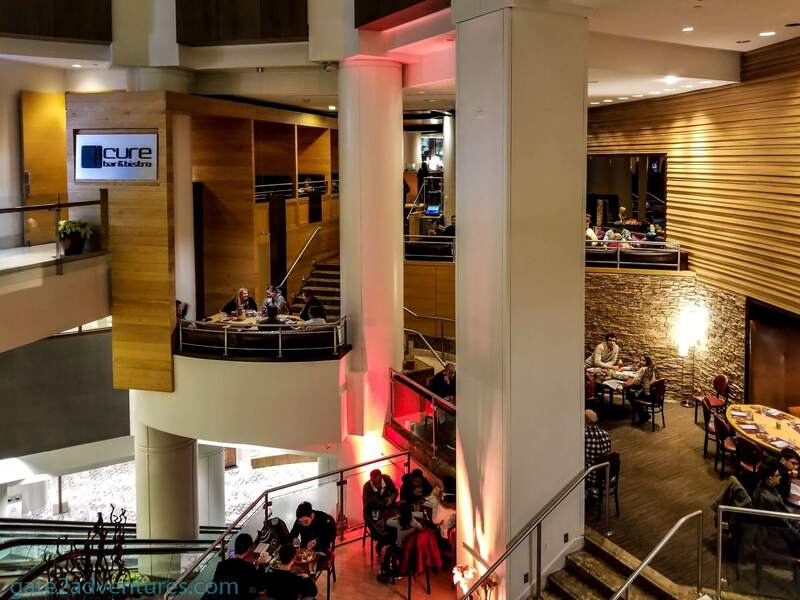 The cool thing about the restaurant is, it is spread out over multiple levels and open towards the atrium. 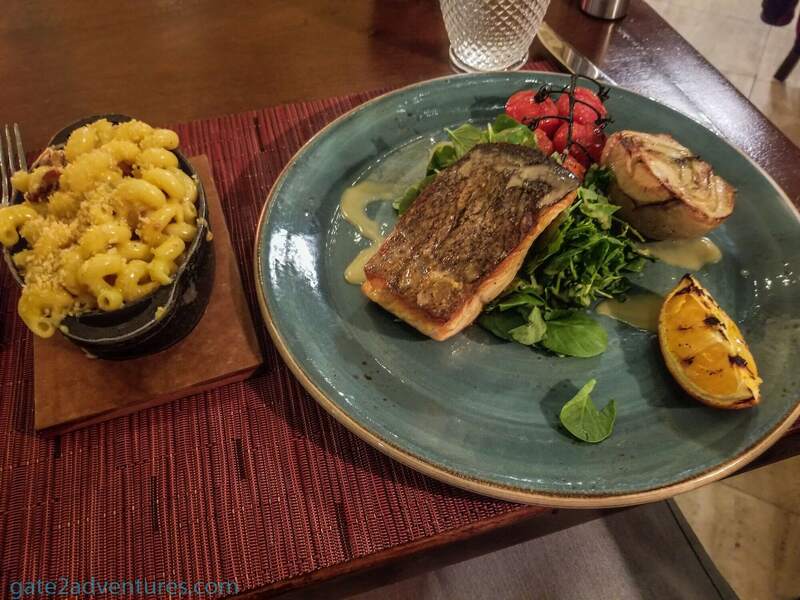 I ordered the salmon and a side of mac & cheese. Both were just delicious and filled me right up. 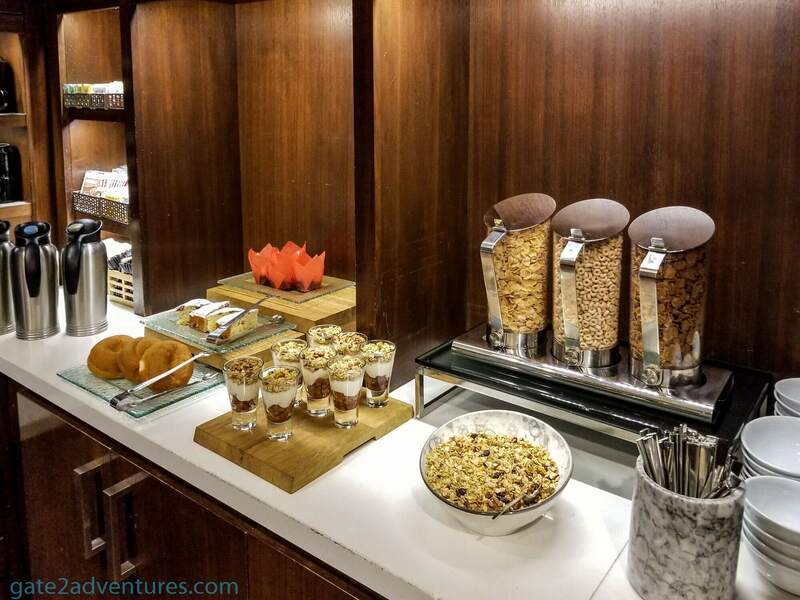 For the once under you who never have enough time, you can grab and stop at the Starbucks on the lobby level for a coffee and quick snack all day long. 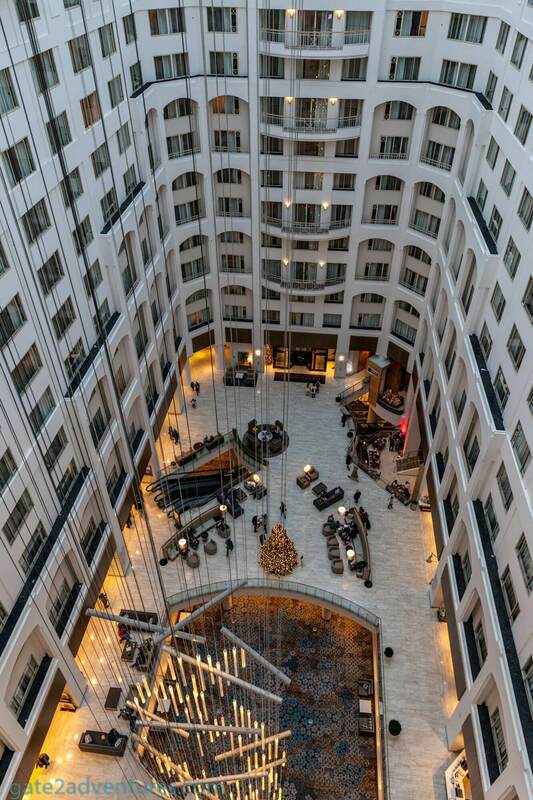 Coming to DC and staying at the Grand Hyatt Washington D.C. was absolutely worth it. I enjoyed my time so much here that I will come back. Staff was extremely friendly and I had some great conversations with the staff at the Grand Club. 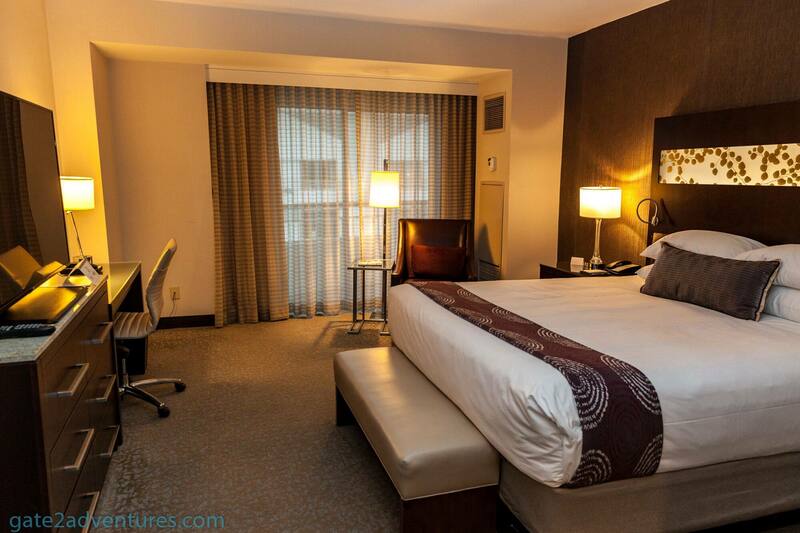 Overall the hotel is well maintained and a perfect location to start exploring DC. 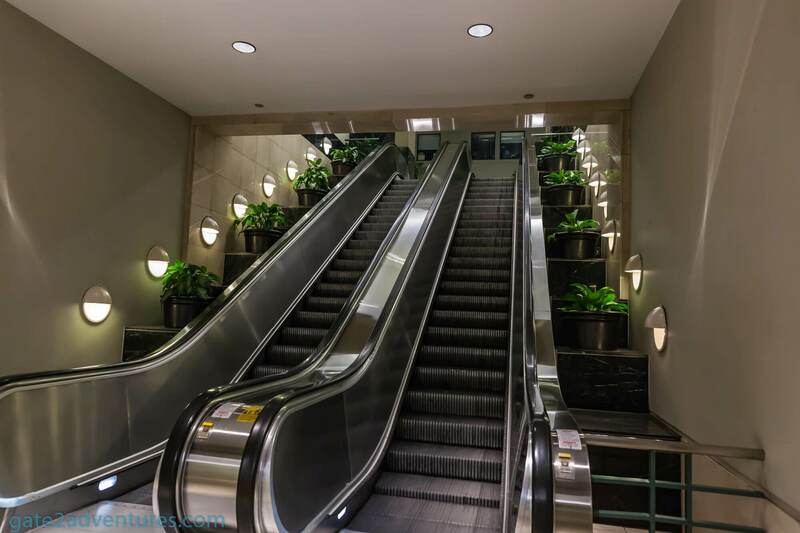 Lots of places are within walking distance and the direct connection to the Metro Center underground station makes it even better to get around in town. The breakfast at the Grand Club could have been a bit better and feature at least some scrambled eggs. Other than that, this was a stay without any issues. Just more great memories. Monday – Friday: 6:30 a.m. – 11:00 a.m.
Saturday – Sunday: 6:30 a.m. – 3:00 p.m.
Monday – Friday: 11:00 a.m. – 1:00 a.m.
Saturday – Sunday: 3:00 p.m. – 1:00 a.m.
Breakfast: 6:30 a.m. – 9:30 a.m. 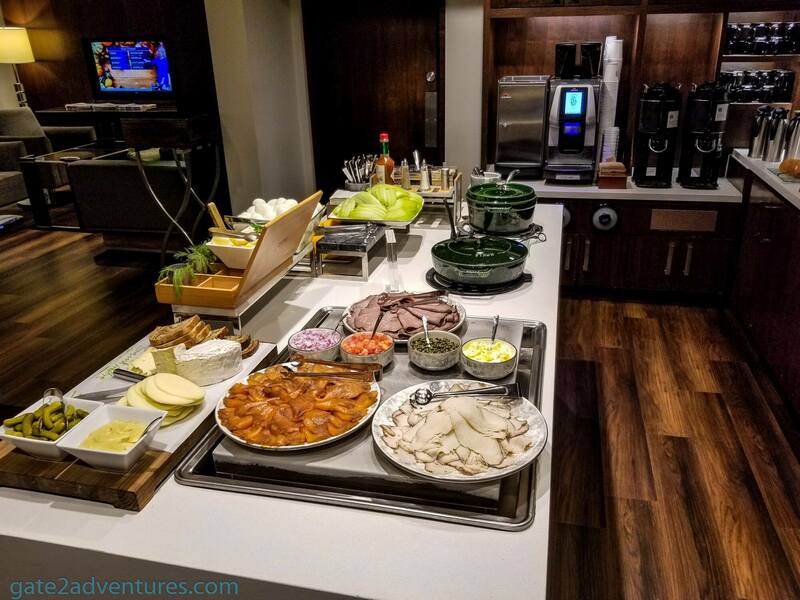 Afternoon Snacks: 12:00 p.m. – 5:00 p.m.
Hors-d’oeuvre: 5:00 p.m. – 8:00 p.m.
Cocktails: 5:00 p.m. – 10:00 p.m.
Dessert Buffet: 8:30 p.m. – 9:30 p.m.
Concierge: 10 a.m. – 6 p.m. The self-parking garage doesn’t offer any in and out privileges, keep that in mind.